We kicked off the holiday weekend in classic form–with a quick trip to the grocery store for supplies and a lovely breakfast of poached eggs over avocado toast with coffee and tea. Though I had Friday off, I spent a good deal of the day working. I finally shut down my spreadsheets and Powerpoint decks around 3 and got in a little exercise before we headed down to the ballpark where we were meeting our usual Friday night dates for a very unusual activity–watching Le nozze di Figaro from Club Level seats at AT&T Park! John had never been to the ballpark, and we thought Friday evening would be the perfect opportunity. After a picnic of fried chicken, pesto pasta salad, roasted corn and wild rice salad and beautiful Oregon cherries, we settled in with ballpark beers to watch our friends fill up the stadium with their soaring voices. It was such a wonderful production that none of us minded the late hour, and when we finally crawled into bed well after midnight, we were still humming our favorite arias and ensembles. On Saturday, I slept in while John cooked up breakfast tacos with all the fixings–roasted potatoes, spicy salsa and guacamole. John caught the cleaning bug and spent the better part of the morning dusting, sweeping and scrubbing while I tacked my to-do list. We hadn't made any big plans for the 4th, so that afternoon we agreed on a classic paella and a bottle of rosé, then grabbed mussels, langostines and chorizo for our supper. After running a few more errands, we mixed up some simple cocktails for a pre-dinner aperitif. John played my handsome sous chef, and we cooked up a rustic Spanish meal that was perfect with an elegant bottle of rosé. Then we curled up to watch The Butler and coconut ice cream with berries, and dashed back up to the roof as our neighbors set off fireworks. We drifted off to sleep with the sound of poppers and sparklers still in our ears. John decided to experiment with a new recipe for Sunday breakfast–polenta with poached eggs drizzled with basil olive oil. After our morning meal and our usual cups of his & hers coffee and tea, we settled into our weekend routine–John's physical therapy and arrangements, my theory practice and a bit of work. We gobbled up the rest of the polenta sprinkled with a bit of Parmesan cheese for lunch, made plans for the big changes we have ahead (can't wait to share more!) and then settled back in with our to do lists for a productive afternoon. After learning that our neighbor and friend had lost his cat, we dashed out to his favorite beer store for a few unusual sympathy gifts, we headed back home for a little workout before strolling across the hallway for dinner with other neighbors (we live in a particularly great building). After dinner of enchiladas and the most perfectly ripe watermelon, we dove straight into bed and into the new week! Tell me, what were you up to this holiday weekend? Swimming in the pool, eating charred hot dogs in potato buns, and watching fireworks perhaps, or are your 4th of July traditions a bit different? 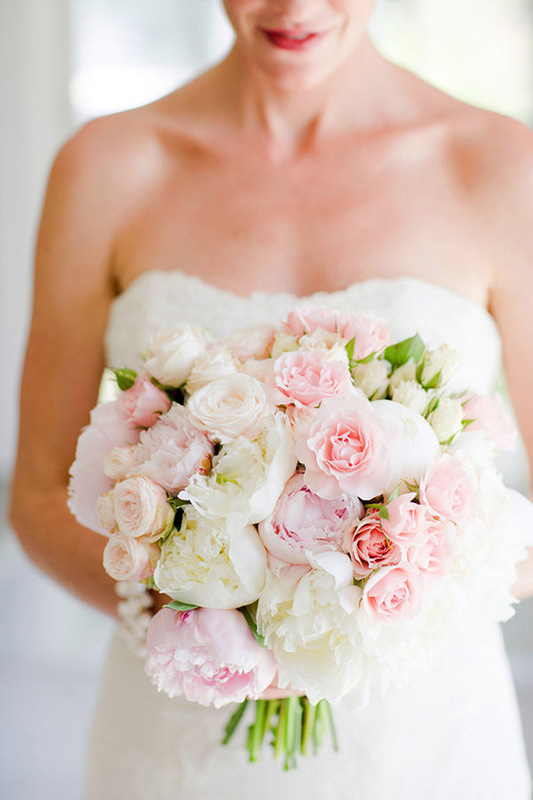 Image by Corbin Gurkin Photography, pink and white bouquet by Claire Bean Events. Such a stunning bouquet of flowers. And a great weekend had by the two of you...ballparks and watermelon. Musts for the 4th of July!